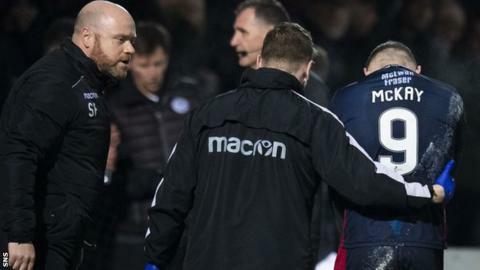 Ross County striker Billy Mckay has been ruled out for the rest of the season with a broken arm. McKay scored a hat-trick in Tuesday's 3-2 win over Ayr United, but he fell awkwardly as he scored the third for Scottish Championship leaders. McKay has scored 20 times this season for the Dingwall side, who are five points clear of Dundee United with a game in hand. "We wish him the best for a speedy recovery," read a club statement.